Are you ready to enjoy lots of great wine, blues, brew & BBQ? 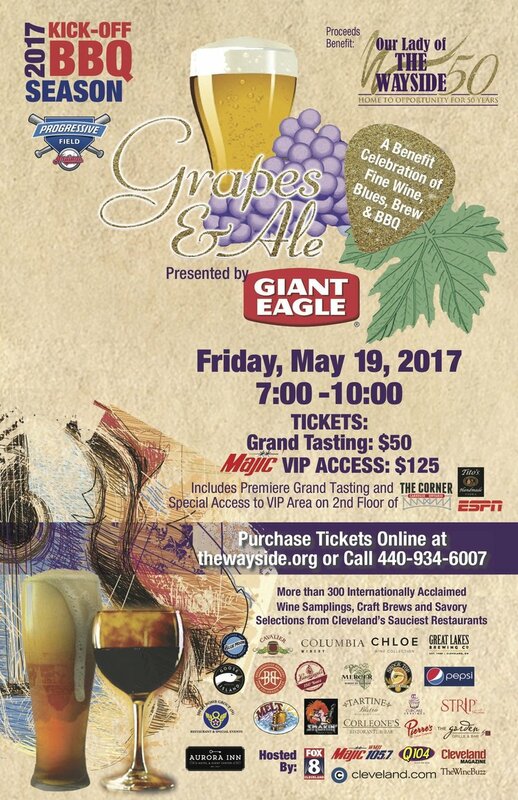 Kick off Summer on Friday, May 19th at Grapes & Ale, Presented by Giant Eagle, and enjoy the hottest BBQ of the year, with samplings of more than 300 internationally acclaimed wines, craft brews and tastes from some of the sauciest BBQ restaurants in town. Admission for One (1) guest to Grapes & Ale, international wine samplings along with summer fare selections from the area's best restaurants (for the latest additions follow us on Twitter ). Guests will also have access to the Craft Beer Area to enjoy samplings of craft beers ($5/10 samples or $10/20), souvenir glass, raffle, wine pull, live music and much more! Admission for One (1) guest to the VIP area located on the 2nd floor of The Corner Bar. In addition to all the amenities of the Premiere Grand Tasting above, VIP guests will sample selections from our Featured Wines and Craft Beers, Tito’s Handmade vodka, hors d’Oeuvres from The Garden Grille & Bar, desserts by Cupcake Cravings and live music. Admission for One (1) guest for summer fare selections from the area's best restaurants, Aquafina and Pepsi products, Live Music and Raffle. You can Purchase tickets or enter to win two tickets here. For an additional entry, head over to Instagram. Winner will be announced May 15.